Lin, Zhaowu Hess, Andrew Yu, Zhaosheng Cai, Shengqiang and Gao, Tong 2019. A fluid–structure interaction study of soft robotic swimmer using a fictitious domain/active-strain method. Journal of Computational Physics, Vol. 376, Issue. , p. 1138. Lee, Jae Bok Park, Sung Goon and Sung, Hyung Jin 2018. Heat transfer enhancement by asymmetrically clamped flexible flags in a channel flow. International Journal of Heat and Mass Transfer, Vol. 116, Issue. , p. 1003. Zhou, Zhiyong Qin, Weiyang Zhu, Pei and Shang, Shijie 2018. Scavenging wind energy by a Y-shaped bi-stable energy harvester with curved wings. Energy, Vol. 153, Issue. , p. 400. Albadawi, A. Specklin, M. Connolly, R. and Delauré, Y. 2018. A Thin Film Fluid Structure Interaction Model for the Study of Flexible Structure Dynamics in Centrifugal Pumps. Journal of Fluids Engineering, Vol. 141, Issue. 6, p. 061402. Park, Sung Goon and Sung, Hyung Jin 2018. Hydrodynamics of flexible fins propelled in tandem, diagonal, triangular and diamond configurations. Journal of Fluid Mechanics, Vol. 840, Issue. , p. 154. Im, Sunghyuk Park, Sung Goon Cho, Yeunwoo and Sung, Hyung Jin 2018. Schooling behavior of rigid and flexible heaving airfoils. International Journal of Heat and Fluid Flow, Vol. 69, Issue. , p. 224. PARK, Sung Goon and SUNG, Hyung Jin 2018. Hydrodynamics of a self-propelled flexible fin in perturbed flows. Mechanical Engineering Reviews, Vol. 5, Issue. 1, p. 17-00286. Ryu, Jaeha Park, Sung Goon and Sung, Hyung Jin 2018. Flapping dynamics of inverted flags in a side-by-side arrangement. International Journal of Heat and Fluid Flow, Vol. 70, Issue. , p. 131. Xia, Qian-Jin Huang, Wei-Xi and Xu, Chun-Xiao 2017. Direct numerical simulation of turbulent boundary layer over a compliant wall. Journal of Fluids and Structures, Vol. 71, Issue. , p. 126. Kim, Boyoung Park, Sung Goon Huang, Wei-Xi and Sung, Hyung Jin 2017. An autonomous flexible propulsor in a quiescent flow. International Journal of Heat and Fluid Flow, Vol. 68, Issue. , p. 151. Virot, Emmanuel Faranda, Davide Amandolese, Xavier and Hémon, Pascal 2017. Chaotic Dynamics of Flags from Recurring Values of Flapping Moment. International Journal of Bifurcation and Chaos, Vol. 27, Issue. 02, p. 1750020. Ye, Huilin Wei, Heng Huang, Haibo and Lu, Xi-yun 2017. Two tandem flexible loops in a viscous flow. Physics of Fluids, Vol. 29, Issue. 2, p. 021902. Zhang, Chengyao Huang, Haibo and Lu, Xi-Yun 2017. Free locomotion of a flexible plate near the ground. Physics of Fluids, Vol. 29, Issue. 4, p. 041903. Xu, Minyi Wang, Yi-Cheng Zhang, Steven L. Ding, Wenbo Cheng, Jia He, Xu Zhang, Peng Wang, Zhengjun Pan, Xinxiang and Wang, Zhong Lin 2017. An aeroelastic flutter based triboelectric nanogenerator as a self-powered active wind speed sensor in harsh environment. Extreme Mechanics Letters, Vol. 15, Issue. , p. 122. Cisonni, Julien Lucey, Anthony D. Elliott, Novak S.J. and Heil, Matthias 2017. The stability of a flexible cantilever in viscous channel flow. Journal of Sound and Vibration, Vol. 396, Issue. , p. 186. Orrego, Santiago Shoele, Kourosh Ruas, Andre Doran, Kyle Caggiano, Brett Mittal, Rajat and Kang, Sung Hoon 2017. Harvesting ambient wind energy with an inverted piezoelectric flag. Applied Energy, Vol. 194, Issue. , p. 212. Wan, Yan Tie, Zheng and Shi, Zilin 2017. Geo-Spatial Knowledge and Intelligence. Vol. 699, Issue. , p. 433. Gallegos, Ralph Kristoffer B. and Sharma, Rajnish N. 2017. Flags as vortex generators for heat transfer enhancement: Gaps and challenges. Renewable and Sustainable Energy Reviews, Vol. 76, Issue. , p. 950. Wang, Li Currao, Gaetano M.D. Han, Feng Neely, Andrew J. Young, John and Tian, Fang-Bao 2017. An immersed boundary method for fluid–structure interaction with compressible multiphase flows. Journal of Computational Physics, Vol. 346, Issue. , p. 131. A three-dimensional computational model is developed for simulating the flag motion in a uniform flow. The nonlinear dynamics of the coupled fluid–flag system after setting up of flapping is investigated by a series of numerical tests. At low Reynolds numbers, the flag flaps symmetrically about its centreline when gravity is excluded, and the bending in the spanwise direction is observed near the corners on the trailing edge. As the Reynolds number increases, the spanwise bending is flattened due to the decrease of the positive pressure near the side edges as well as the viscous force of the fluid. At a certain critical Reynolds number, the flag loses its symmetry about the centreline, which is shown to be related to the coupled fluid–flag instability. The three-dimensional vortical structures shed from the flag show a significant difference from the results of two-dimensional simulations. Hairpin or O-shaped vortical structures are formed behind the flag by connecting those generated at the flag side edges and the trailing edge. Such vortical structures have a stabilization effect on the flag by reducing the pressure difference across the flag. Moreover, the positive pressure near the side edges is significantly reduced as compared with that in the center region, causing the spanwise bending. The Strouhal number defined based on the flag length is slightly dependent on the Reynolds number and the flag width, but scales with the density ratio as St ~ ρ−1/2). On the other hand, the flapping-amplitude-based Strouhal number remains close to 0.2, consistent with the values reported for flying or swimming animals. A flag flapping under gravity is then simulated, which is directed along the negative spanwise direction. The sagging down of the flag and the rolling motion of the upper corner are observed. The dual effects of gravity are demonstrated, i.e. the destabilization effect like the flag inertia and the stabilization effect by increasing the longitudinal tension force. Alben, S. & Shelley, M. J. 2008 Flapping states of a flag in an inviscid fluid: bistability and the transition to chaos. Phys. Rev. Lett. 100, 074301. Allen, J. J. & Smits, A. J. 2001 Energy harvesting eel. J. Fluids Struct. 15, 629–640. Argentina, M. & Mahadevana, L. 2005 Fluid-flow-induced flutter of a flag. PNAS 102, 1829–1834. Balint, T. S. & Lucey, A. D. 2005 Instability of a cantilevered flexible plate in viscous channel flow. J. Fluids Struct. 20, 893–912. Beal, D. N., Hover, F. S., Triantafyllou, M. S., Liao, J. C. & Lauder, G. V. 2006 Passive propulsion in vortex wakes. J. Fluid Mech. 549, 385–402. Connell, B. S. H. & Yue, D. K. P. 2007 Flapping dynamics of a flag in a uniform stream. J. Fluid Mech. 581, 33–67. 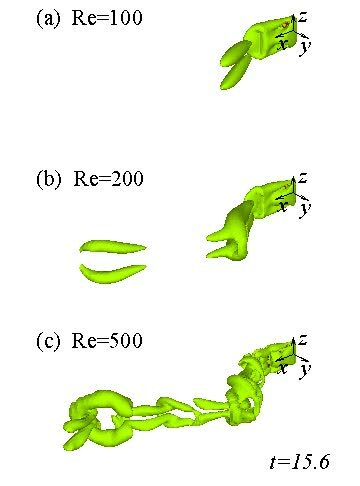 Eldredge, J. D. & Pisani, D. 2008 Passive locomotion of a simple articulated fish-like system in the wake of an obstacle. J. Fluid Mech. 607, 279–288. Eloy, C., Lagrange, R., Souilliez, C. & Schouveiler, L. 2008 Aeroelastic instability of cantilevered flexible plates in uniform flow. J. Fluid Mech. 611, 97–106. Eloy, C., Souilliez, C. & Schouveiler, L. 2007 Flutter of a rectangular plate. J. Fluids Struct. 23, 904–919. Farnell, D. J. J., David, T. & Barton, D. C. 2004 Numerical simulations of a filament in a flowing soap film. Intl J. Numer. Methods Fluids 44, 313–330. Fish, F. E. & Lauder, G. V. 2006 Passive and active flow control by swimming fishes and mammals. Annu. Rev. Fluid Mech. 38, 193–224. Goldstein, D., Handler, R. & Sirovich, L. 1993 Modeling a no-slip flow boundary with an external force field. J. Comput. Phys. 105, 354–366. Guo, C. Q. & Païdoussis, M. P. 2000 Stability of rectangular plates with free side-edges in two-dimensional inviscid channel flow. Trans. ASME: J. Appl. Mech. 67, 171–176. Huang, L. 1995 Flutter of cantilevered in axial flow. J. Fluids Struct. 9, 127–147. Huang, W.-X., Shin, S. J. & Sung, H. J. 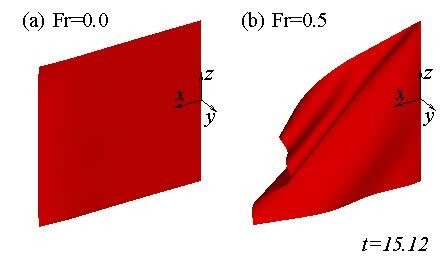 2007 Simulation of flexible filaments in a uniform flow by the immersed boundary method. J. Comput. Phys. 226, 2206–2228. Huang, W.-X. & Sung, H. J. 2009 An immersed boundary method for fluid-flexible structure interaction. Comput. Methods Appl. Mech. Engng 198, 2650–2661. Jia, L.-B., Li, F., Yin, X.-Z. & Yin, X.-Y. 2007 Coupling modes between two flapping filaments. J. Fluid Mech. 581, 199–220. Jia, L.-B. & Yin, X.-Z. 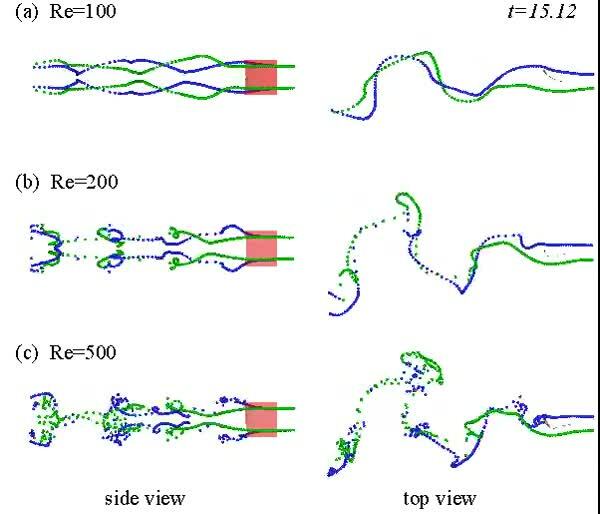 2008 Passive oscillations of two tandem flexible filaments in a flowing soap film. Phys. Rev. Lett. 100, 228104. Kim, K., Baek, S.-J. & Sung, H. J. 2002 An implicit velocity decoupling procedure for incompressible Navier–Stokes equations. Intl J. Numer. Methods Fluids 38, 125–138. Kim, Y. & Peskin, C. S. 2007 Penalty immersed boundary method for an elastic boundary with mass. Phys. Fluids 19, 053103. Lemaitre, C., Hémon, P. & de Langre, E. 2005 Instability of a long ribbon hanging in axial air flow. J. Fluids Struct. 20, 913–925. Li, L., Damodaran, M. & Gay, R. K. L. 1996 Aerodynamic force models for animating cloth motion in air flow. The Vis. Comput. 12, 84–104. Liao, J. C., Beal, D. N., Lauder, G. V. & Triantafyllou, M. S. 2003 Fish exploiting vortices decrease muscle activity. Science 302, 1566–1569. Manela, A. & Howe, M. S. 2009 a On the stability and sound of an unforced flag, J. Sound Vib. 321, 994–1006. Manela, A. & Howe, M. S. 2009 b The forced motion of a flag, J. Fluid Mech. 635, 439–454. Michelin, S., Llewellyn Smith, S. G. & Glover, B. J. 2008 Vortex shedding model of a flapping flag. J. Fluid Mech. 617, 1–10. Païdoussis, M. P. 2004 Fluid–Structure Interaction: Slender Structures and Axial Flow, vol. 2, Academic. Peskin, C. S. 2002 The immersed boundary method. Acta Numer. 479–517. Ristroph, L. & Zhang, J. 2008 Anomalous hydrodynamic drafting of interacting flapping flags. Phys. Rev. Lett. 101, 194502. Shelley, M., Vandenberghe, N. & Zhang, J. 2005 Heavy flags undergo spontaneous oscillations in flowing water. Phys. Rev. Lett. 94, 094302. Taneda, S. 1968 Waving motion of flags. J. Phys. Soc. Japan 24 (2), 392–401. Tang, L. & Païdoussis, M. P. 2007 On the instability and the post-critical behaviour of two-dimensional cantilevered flexible plates in axial flow. J. Sound Vib. 305, 97–115. Tang, D. M., Yamamoto, H. & Dowell, E. H. 2003 Flutter and limit cycle oscillations of two-dimensional panels in three-dimensional axial flow. J. Fluids Struct. 17, 225–242. Taylor, G. W., Burns, J. R., Kammann, S. M., Powers, W. B. & Welsh, T. R. 2001 The energy harvesting eel: a small subsurface ocean/river power generator. IEEE J. Ocean. Engng 26 (4), 539–547. Taylor, G. K., Nudds, R. L. & Thomas, A. L. R. 2003 Flying and swimming animals cruise at a Strouhal number tuned for high power efficiency. Nature 425, 707–711. Terzopoulos, D. & Fleischer, K. 1988 Deformable models. The Vis. Comput. 4, 306–331. Triantafyllou, M. S., Triantafyllou, G. S. & Yue, D. K. P. 2000 Hydrodynamics of fishlike swimming. Annu. Rev. Fluid Mech. 32, 33–53. Watanabe, Y., Isogai, K., Suzuki, S. & Sugihara, M. 2002 a A theoretical study of paper flutter. J. Fluids Struct. 16, 543–560. Watanabe, Y., Suzuki, S., Sugihara, M. & Sueoka, Y. 2002 b An experimental study of paper flutter. J. Fluids Struct. 16, 529–542. Williamson, C. H. K. 1996 Vortex dynamics in the cylinder wake. Annu. Rev. Fluid Mech. 28, 477–539. Yadykin, Y., Tenetov, V. & Levin, D. 2001 The flow-induced vibration of a flexible strip hanging vertically in a parallel flow. Part 1. Temporal aeroelastic instability. J. Fluids Struct. 15, 1167–1185. Zhang, J., Childress, S., Libchaber, A. & Shelley, M. 2000 Flexible filaments in a flowing soap film as a model for one-dimensional flags in a two-dimensional wind. Nature 408, 835–839. Zhu, L. & Peskin, C. S. 2002 Simulation of a flapping flexible filament in a flowing soap film by the immersed boundary method. J. Comput. Phys. 179, 452–468. Movie 1. A flapping flag of H=1.0 and ¥ñ=1.0: (a) Re=100; (b) Re=200; (c) Re=500. The flow is along the positive x-axis. Movie 2. Vortical structures shed from the flapping flag of H=1.0 and ¥ñ=1.0: (a) Re=100; (b) Re=200; (c) Re=500. The ¥ë2-criterion is used to identify the vortical structures and an isovalue of ¥ë2=-0.2 is chosen to plot the 3D contours. Movie 3. Motion of tracing particles: (a) Re=100; (b) Re=200; (c) Re=500. The particles are released at (-0.5, ¡¾0.2, ¡¾0.3) with a time interval of 0.05. Movie 4. Vortical structures shed from the flapping flag of H=0.5 and ¥ñ=1.0: (a) Re=100; (b) Re=200; (c) Re=500. Movie 5. Vortical structures shed from the flapping flag of H=0.5 and ¥ñ=2.0: (a) Re=100; (b) Re=200; (c) Re=500. Movie 6. A flag of H=1.0 and ¥ñ=1.0 flapping under the gravity force at Re=200: (a) Fr=0.2; (b) Fr=0.5; (c) Fr=1.0. The gravity force is directed along the negative z-axis. Movie 7. A flag of H=1.0 and ¥ñ=0.2 flapping at Re=200: (a) Fr=0; (b) Fr=0.5.